The Atlanta Railroads, Their History and Their Story. This beautiful documentary covers the phenomenal history of the railroad capitol of the south. A city 'born of the railroad', Atlanta's history is traced from it's beginnings as a terminus for the state owned Western & Atlantic. We continue with the development and growth of many lines such as the Nashville, Chattanooga & St. Louis; the Louisville & Nashville; the Southern; the Central of Georgia; the Atlantic Coast Line; the Seaboard Air Line; and the Georgia Railroad (to name just a few). Most of these lines merged to form the CSX and Norfolk Southern railroads and you will see their modern operations through a city handling 200 trains per day. The story is told in documentary fashion ( similar to the critically acclaimed Civil War series seen on PBS). 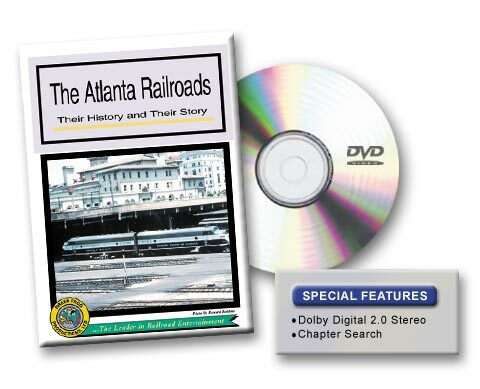 Noted Atlanta historians Franklin M. Garret and Col. Jim Bogle provide a unique look into a rich railroad history as shown through rare film and unpublished photos from numerous collections. Professional narration is provided by Hollywood and TV actor Dan Chandler.